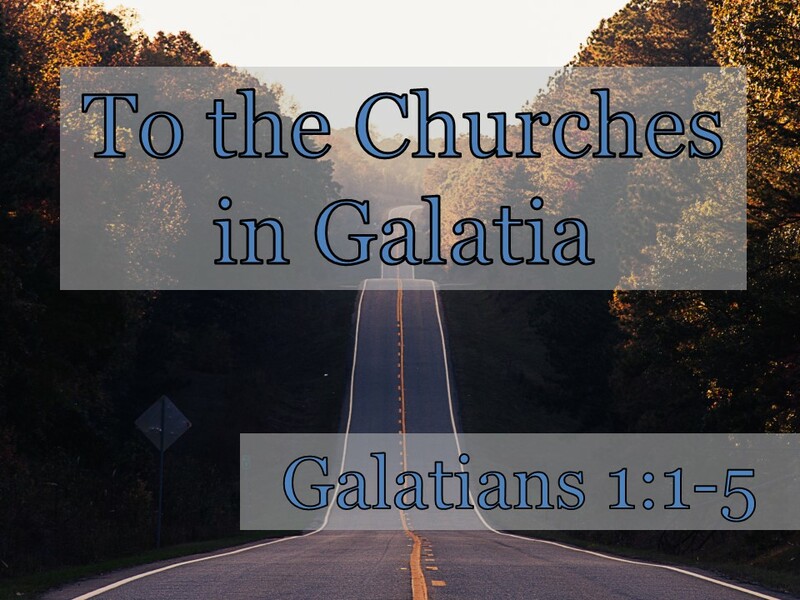 [Matt's Messages] "To the Churches in Galatia"
The Epistle to the Galatians...FINALLY! I know that I’ve been promising it for several weeks, and not delivering. But we are here today! I still don’t feel ready. If I hadn’t told Marilynn to put it on the back of your bulletin, I might have pulled up again and taken more time to study. Galatians a short book, but it’s a challenging one. And it’s important to get it right. 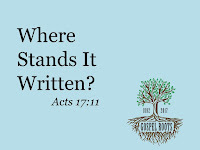 That’s a phrase that the apostle Paul uses a number of times in this book to describe the message of the good news of Jesus Christ and how important it is. This letter was written because the truth of the gospel was in danger of being lost. And if the truth of the gospel was ultimately lost, the results would be unbelievably tragic. That’s why Paul has taken up his pen. And that’s one of the reasons why we need to read it today. You might be wondering why I picked the book of Galatians as our next Bible book to study together. There are a lot of reasons why I think God has this book for us next. One is simply that we’ve spent a lot of time in Old Testament together. It’s time to return to the New Testament for a while. I know that some of you were hoping we’d go back to the Books of Kings again soon (just kidding), but I do think we need us some good New Testament teaching. Some grace upon grace in our Lord Jesus Christ. And this book is full of grace. High octane grace. Another reason is that I wanted to reinforce what we learned in the book of Romans in 2014, 15, and 16. Do you remember what we learned in Romans together about justification? Well, Galatians is sometimes called, “The Little Romans” because it’s so short but it covers similar ground. It was written for a different group of people in a different situation, but it covers similar teaching in a few short, power-packed chapters. Another thing I wanted to do was to fill in for us a little more of the connections between the book of Acts and the letters of Paul. Do you remember when we did the book of Acts back in 2011? The years are piling up since then, and I want to tie what we were learning there together with what we’re learning now. Another big reason I was drawn to Galatians was its connection with the Reformation in the history of the church. This year is our 125th anniversary as a local church, and it is also the 500th anniversary of the rediscovery of the gospel that historians call the Protestant Reformation. And Galatians was the book that probably had the biggest impact on Martin Luther and the rest of the Reformers in the 16th century. Maybe Romans, but definitely Galatians was used powerfully to rediscover, recapture, and restate the gospel of grace once again to reform the church. Galatians was Martin Luther’s favorite book of the Bible. He loved it. He once said that he was married to it. You know that joke kids say? Well, Luther felt like he had married the Book of Galatians. He called this book his “Katherine.” Which was the name of his wife. But I know that Galatians is good and glorious and worthy of our attention. To be honest, I’ve been intimidated by this letter. And that’s partly right. Because it’s a thunderously powerful book. It is challenging at points to interpret. But just because I’m intimidated by it doesn’t mean that we shouldn’t read it together. In fact, it means we should read it together! So another one of the reasons why we’re studying this now is so that I get over my fears, and we get into the potent message of this epistle. This is God’s Word. And I want what this little book teaches for our church family. I want the truth of gospel for our church family. I want us to be able to recognize and repudiate every threat there is to the gospel. I don’t want us to lose the gospel. I want us to know the gospel backwards and forwards and spot every counterfeit as it comes our way. I want us to live our lives in accordance with the truth of gospel. We can say we believe the gospel and live in such a way that denies the truth of gospel. We’re going to see that one of the apostles was doing just that! I want us to finish with the gospel. Not just start with it. But finish with it. And I want to understand the implications of the truth of gospel. Which means freedom and fruit. And that’s our middle name, right? Lanse Free Church? Because of the truth of the gospel we are free. And we need to understand that. And not just freedom but fruit. Our Wednesday night prayer group is spending the next two months on two verses in Galatians chapter 5. The fruit of the Spirit is love, joy, peace, and ... we’ll find out the rest as we go. This book is full of glorious gospel truth that has the power to change our lives forever. That’s why we’re studying it. Sound good? Alright. We’re not going to get very far this morning. I just want us to put our toes in the water of chapter 1. Just the first 5 verses. In verse 6, Paul really takes off. He doesn’t have very much opening material. But that’s all we’re going to take time for this morning. Just verses 1 through 5. Just 5 verses, but so much there! You can tell that this is a letter. Letters in this time period began with the author of the letter and then the recipients and some kind of a greeting. Kind of like some email programs. The top field is who is sending it. From what address do you want this to go out. The next field is whom it is sent to. And then in the subject line or the body of the email you put a greeting. “Hey there!” “Greetings!” “Good day to you.” “Hope you are doing well.” “We miss you here.” Or whatever. That’s pretty much what you have here, except that every line of it is dripping with a deeper meaning with spiritual significance. Paul doesn’t throw away his words. He doesn’t just throw some words out there buckshot. He aims every one of his words with rifle precision. And every one is worth studying. So it’s Paul and his spiritual family (verses 1 and 2) writing to “the churches in Galatia” (v.2) and then the greeting in verses 3, 4, and 5. Here’s an outline of what we’re going to see in these first five verses. And I’m going to have an application point for each item. The author is the Apostle Paul. But that’s not all that he says about himself. Look again at verse 1. Do you see how much is in there? He’s got a lot more crammed in there, and that’s for a reason. You see, we’re going to learn in the next few weeks that Paul was and Paul’s gospel was under attack. Some false teachers had infiltrated the churches in Galatia and they were undermining what Paul had taught the Galatians about the truth of the gospel. And they were throwing suspicion on the credentials and qualifications of Paul. Did you ever have that happen to you? And that’s probably true! But they were apparently saying it about Paul. An apostle is an authorized representative. Somebody who is sent from another person and authorized to speak for him. His apostleship is not by mere human origin. It is divine. His apostleship is by divine origin. He has been sent directly by God. Now, that does not mean that there aren’t human beings who are behind him and supporting him. The church at Antioch, we learned back in the book of Acts, was in some ways his sending church. They prayed and supported and sent. But they didn’t give him his message. And they didn’t give him his calling. He isn’t the authorized representative of the church of Antioch. Here’s our first application point for this book. Paul is going out of his way to say that what he has to say is from God. These are not just his thoughts and opinions. He is not just speaking out of his own ideas. He is writing as an apostle sent by Jesus Christ Himself...and God the Father who raised Jesus from the dead! In this letter, Paul is going to use some really really really strong language. He’s very concerned about the situation in Galatia. And he’s going to sound the alarm. We’ll see that next week. You might be surprised how strong he gets with his language. It’s because he thinks the problem warrants it. One author says, “The book of Galatians is a tornado warning” (Timothy George). Like that siren in Winburne that goes off if a tornado is approaching (or there’s a fire). It’s strong stuff. I’m glad I’m not standing there at the fire station when it goes off. Paul is saying here that the Galatians need to listen. He is not an imposter. He is not just some guy with an opinion. He is an apostle sent, not by any human, but by Jesus Christ and God the Father who raised Jesus from the dead. He’s trying to get their attention. Now, I’d like to spend some time talking about Paul’s conversion on the Damascus Road and his call to ministry. And I’d like to talk about how Jesus Christ and God the Father are equals here. There’s Trinity language here. But I also want to get all the way to verse 5 and not get stuck in verse 1 this week, so we’ll keep going. The most important event in human history. Jesus came back from the dead, raised by His Father. And there is no turning back to way things were. We’re going to see that some of these false teachers were trying to turn back the clock to before Jesus and His resurrection. But now that the resurrection has happened, everything has changed. And if the God who brought back Jesus from the dead has personally sent Paul as his authorized representative to share a message, we better listen up. We better put our ears on. Amen? That’s why we are taking this book so seriously. Because it’s a word from God! Paul wasn’t alone when he wrote this letter. And even though these brothers and sisters around him were not sending him or authorizing his message, they agreed with it, too. He isn’t alone with this message. Even if he alone is the apostle composing it. Now, that’s the title of our message. And it reminds us that this is a letter from a real person to real people. There is a little debate about which Galatians these are. There were people of the ethnicity of Galatia that lived in the Northern part of the province of Galatia. By the way, Galatia isn’t a city. It’s a region. That’s not a city, it’s an area. And there were folks who were ethnic Galatians in northern Galatia. But most biblical scholars believe that this was written to the churches that Paul established on his first missionary journey through Southern Galatia. Remember this map from the book of Acts? Places and routes from Paul’s first missionary journey? Acts chapter 13 and 14? Starting in Antioch, going to Cyprus, then eventually to Pisidian Antioch, Iconium, Lystra, Derbe. Do you remember those names? Those are cities in Galatia. And there were churches there that Paul established. These were his children in the faith. And he cares deeply about them. But he doesn’t praise them. He doesn’t thank God for them. He doesn’t tell them what he thanks God for when he thinks about them. Did you ever notice that Paul normally does that? In his letters, Philippians, Colossians, Thessalonians, right after the part where he says their name, he normally tells them how thankful he is for them. Now, this is probably the oldest of Paul’s letters. It’s one of the first documents of the early church. Written between 47-49 AD. Long before the gospels were written! So he isn’t necessarily breaking his usual pattern. Because he hasn’t set that pattern yet that we know of. But he sure does skip any thanksgiving! There is a problem here with these churches. These churches that Paul established are in danger and potentially have lost their way. He does not give thanks for them. That’s what Paul wants for them. In a second, he’s going to turn on the tornado alarm, but the point is not disturb their peace but to seek their peace. Those were normal, standard greetings in Paul’s day. Somebody sent me an email this week that signed off, “Pax.” The Latin for peace. He means, GRACE and PEACE. He means the gospel of grace and the peace that comes from it. These are not just little insignificant words. These are the deepest prayers of Paul for these people whom he loves. Here’s application #2. RECEIVE GRACE AND PEACE. And pray for it for it, too, for others. Grace is unmerited favor. Unearned blessing. Spiritual benefit given to you as a present, a gift. Grace is one of the most important themes in Galatians. We’re going to talk about it just about every week we are in this book together. God’s free gift. That’s grace. And when you have that grace, you have peace. Peace with God, peace with others, and inner peace all flow out of grace. Each one of Paul’s letters starts with a mention of those two things. One commentator writes, “‘Grace and peace’ are a succinct summary of the entire Christian message...Grace is God’s unmerited goodwill freely given and decisively effective in the saving work of Jesus Christ. Peace...on the other hand, denotes a state of wholeness and freedom that the grace of God brings” (Timothy George, Galatians, pg. 85). That’s why we are reading this book together this Summer. Because I want grace and peace for you and me. That’s going to be my prayer for you every day this Summer. Will you make that your prayer for this church as we work our way through Galatians together? And from where? Not from ourselves. Not from our families, or our government, or our jobs. There they are again. He’s switched the order from verse 1, but it’s the same two persons working together. God OUR Father (notice the “our” like in the Lord’s Prayer) and God the Son, the Lord Jesus Christ. There is so much there! It’s the gospel, right? He chose death. He chose the Cross. Remember all that stuff we read in Psalm 22? We won’t get to my favorite verse in the book of Galatians for a few weeks, but it’s chapter 2, verse 20. Paul just can’t get over how Jesus loved him. That’s where grace and peace come from! They don’t come from hard work and effort. They come from knowing the love of Jesus Christ. The sacrificial love of Jesus Christ on the Cross. He’s talking about the Cross. Why did Jesus have to die like that? I was talking to a pastor last night who was asked by an attender at their church why the Cross had to be so drastic. Why couldn’t the salvation we have be a little less dramatic, a little less bloody, a little less deathish? And I don’t know all of the answers to that, but one thing I do know is that my sin is that ugly, that corrupted, that putrid and offensive to a holy God that it took the sacrificial death of Jesus Christ to pay for it. We couldn’t do it on our own. We needed a break out. We needed a rescue mission. Tomorrow is Memorial Day when we who are Americans remember those servicemen and women who fought and died for our protection and for the freedoms we enjoy in this country. We are thankful for all of the ways we were rescued by their sacrifices. And their sacrifices are a kind of echo, a reverberation of the greatest sacrifice ever made in the greatest rescue operation ever launched. Jesus came to die and rescue us from present evil age. The Jews of this day divided up history into the present age and the age to come. And when Jesus died, He broke the power of the sin, He broke the power of the world, and He gave us a new freedom to live as citizens of the age to come. We who are Christians have been busted out of the power of this world. We still live here, but we are not longer enslaved to this world. We are no longer enslaved to sin. We have been busted out. Our Exodus has come, and we’re on the road to the Promised Land! That’s what the threat is here. We’re going to see it next week. The penalty of sin has been paid. The power of sin has been broken. Someday, even the presence of sin will be no more. They worked in perfect tandem. Isn’t it interesting how often God has been called a Father in Galatians and we’re only 4 verses in? Here it says that the Father willed the sacrifice of His own son. That’s what Isaiah 53 says, right? “...it was the LORD's will to crush him and cause him to suffer...” for our sins. How terrible for the Father! This is the truth of the gospel. It’s at the center of everything, and it changes everything! And it’s where you and I can find grace and peace. Paul hasn’t even started the letter yet. But he’s already praising God. He feels these things so deeply. He sees these things so clearly. He can’t help but praise the Lord for what Jesus did for us. Do you feel that amen? Sometimes the best application of a Scripture passage is simply to worship God and thank Him for what He has done. Let’s do that. Let’s sing hymn #345 about the amazing blessings of knowing God through Jesus Christ. And let’s not stop singing and worshiping God. Let’s bring Him the glory forever and ever. In just a few moments, Jamie Johnston is going to go public with her faith in Jesus Christ. Because that’s one of the things that baptism means and does. Baptism is a public declaration of faith in Jesus Christ, a statement to the world that the one being baptized believes in Jesus and has been saved from their sins by Jesus and what Jesus did for them on the Cross. And they are now publicly identifying themselves as a follower of Jesus. It’s kind of like when an athlete signs onto a team. You know what I’m saying? They have one of those signing ceremonies? College athletes. Professional athletes. They sit behind that desk and they sign on the dotted line. Everybody’s smiling. And then maybe they get a team jersey and they hold it up for the camera. And that’s the moment when they publicly join the team. The military does something like that, too. They take an oath. There’s a ceremony. They raise their right hand. And they join up. They, too, get an uniform. Or like a wedding ceremony. The bride and groom stand before witnesses and they exchange promises and, n our culture, they exchange rings. They go public with their covenant with one another. Everybody might have known already that they loved one another and were committed to one another, but this ceremony makes it official. And water baptism, for the Christian, has a very similar effect. Baptism is the God-ordained way of going public with your faith. Baptism is the God-ordained way of identifying yourself with Jesus Christ. And that’s what Jamie is doing this morning and our church family is pleased to be a part of. Now, there are other good ways of going public with your faith. You can walk an aisle at an evangelistic meeting. You can post something on your social media account about your love for Jesus. You can stick a bumper sticker on your car or take out a billboard! But water baptism is not just a good way of going public with your faith, it’s God’s good way of going public with your faith. Read the book of Acts. The pattern is clear. The gospel gets preached. People believe and get saved. And then they get baptized. The gospel gets preached. People believe and get saved. And then they get baptized. Followers of Jesus Christ go public with their faith through water baptism. Now, water baptism is just a picture. It is an outward symbol of an inner reality. I often liken it to a wedding ring. This gold band on my finger does not make me married to Heather Joy. Our public ceremony didn’t make me married to Heather Joy. My covenantal relationship with Heather Joy makes me married to her (Praise the Lord! ), and this ring symbolizes our marriage to the watching world. Water baptism is a public symbol, as well. It doesn’t DO anything by itself (it’s not magic), but it SAYS lots of things. And I think that this little verse shows us at least two. Now, you can tell from the word “therefore” that this verse is part of a larger context, a larger argument. Paul is actually talking about ministry in this section. And this verse fits into that larger argument as an explanation of how Paul goes about his apostolic ministry. But we don’t have time this morning to develop the larger argument. We’ve got a dunking to do here! So we’ll save that for another day. Here we’re just going to look at this one sentence and see what it tells us about being a Christian (and therefore what Christian baptism signifies, what it says to the world). “In Christ” is the Apostle Paul’s shorthand description of being identified with Christ. Our position in Christ, the benefits and blessings of being in Christ, the inclusion we have in Christ’s righteousness, Christ’s standing with the Father, Christ’s holiness, and so on. “In Christ” is Paul’s way of signifying our UNION WITH CHRIST in His death and resurrection. Our vital, living union with Christ. Are you in Christ? Have you been joined to Jesus Christ by faith? Have you trusted in Jesus Christ alone for the forgiveness of your sins and the gaining of eternal life? There is no more important question to have answered! Jamie has answered that question. In a few moments, she will share the story she shared in her baptism interview. That she has come to believe the Gospel of Jesus Christ and is now “in Christ.” And going public about it in baptism. You are either in Christ or OUTSIDE of Christ. And that is the scariest place to be in the whole universe. If you are in Christ, have you gone public with your faith through water baptism? That’s what water baptism portrays, being in Christ. Going down in the water symbolizes your union with Christ in His death and burial. Coming up out of the water symbolizes your union with Christ in His resurrection. Baptism is a God-given picture that signifies to the world that you are in Christ. In all real Christians, God has done a new work of creation! And just as God created everything we see and feel and touch and smell in this creation, He has also done a work of New Creation–He has brought about a decisive change inside of the new Christian. We often call that new work of creation: regeneration. Being “born again.” Being given new spiritual life, a new heart, a new life–fit for the world to come. Now, that almost sounds like a new Christian is not at all like they used to be. They are perfect, they never sin, they have arrived, the old has gone[! ], the new has come[!]. If that’s true, then Jamie is not ready yet to be baptized because she is not perfect yet. And neither is her pastor! But I don’t think that’s what he’s saying. Paul knows that Christians have not yet arrived. He says that very thing about himself in multiple places. What Paul is saying is that something new has happened that is decisive for this person. Being “in Christ” means that God has started something dramatic and unstoppable in this person’s heart and made them a New Creation. And the Old Slave-Driver of Sin and the Old Required Allegiance to the Prince of this World are out in their penalty and position and power in our lives. And the new master of righteousness and allegiance to the true Lord of the universe has begun. That’s what Christian baptism signifies. And that’s why people should get baptized sooner rather than later in their Christian life. Baptism is not for mature Christians. It’s for new Christians. Christians that have become a New Creation. 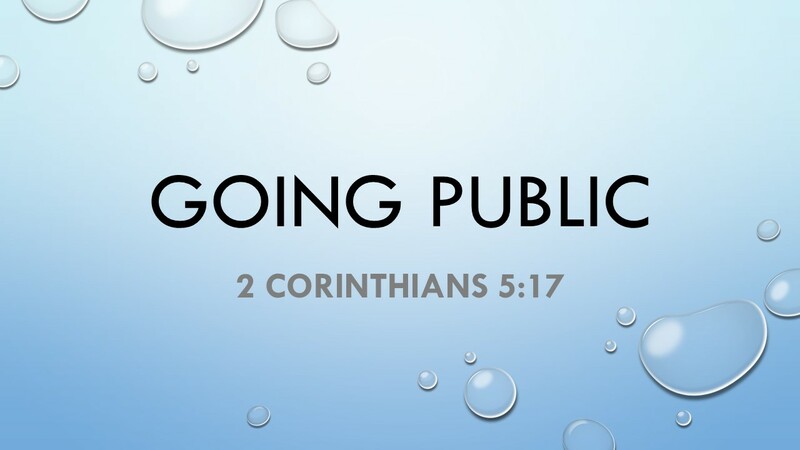 Christian baptism is going public about being In Christ and being a New Creation. God is the One who includes us IN CHRIST through our faith. God is the One who creates a NEW CREATION in us that says good-bye to the old and in with the new. And our response to God’s work is to live it out. We are to believe that we are “In Christ” with all of the blessings and benefits and privileges that go along with that. And we are to live as New Creations. We are to live new lives. In the first few centuries of the Christian Church, baptismal candidates did this very dramatically. When...the time for baptism...arrived, the candidate would be called upon to renounce the Devil and all his pomp. Facing westward, the direction in which the sun went down, he would exclaim, ‘I renounce thee, O Satan, and all they works!’Then he would deliberately spit three times in the direction of darkness, signifying a complete break with the power of evil and all their former claim on his life. Next, turning towards the sunrise, he would say, ‘And I embrace Thee, O Lord Jesus Christ!’ This would be followed by immersion... (The Mark of Jesus, pg. 33-34). That’s what Jamie is about to do. She is spitting in Satan’s face and symbolizing through her baptism that she is in Christ a, new Creation. Again, Jamie’s baptism does not make her a Christian. I see lots of people wearing black and gold jerseys. That does not make them a Pittsburgh Steeler, right? Just putting on the jersey doesn’t put you on the team. But if you are on the team, you put on the jersey. If you are married, you put on the ring. If you are a Christian, you go public with Christianity and tell the world that you identify with Jesus. “I am His and He is mine. He has saved me through His death and resurrection. There is a little word in the Greek of verse 17 that doesn’t get translated into the English of the NIV. I think it’s there in the exclamation mark at the end of the sentence. But the old King James has an English word for it and the English Standard Version has it, too. It’s right there to see. * The title of this message reflects my great debt to Bobby Jamieson's book Going Public: Why Baptism Is Required for Church Membership which I found really helpful for thinking about the ordinance of baptism. While ultimately unpersuaded by his thesis in regards to baptism and membership (and sticking to an EFCA approach to this practice), I was significantly sharpened in my theology and practice of baptism. I highly recommend it and will use this language of "going public" from here on. David Powlison has had an enormous influence on me. He's one of those teachers (in articles and books as well as live in class) who get counted on one hand as having an outsized impact on my thinking about how the Bible relates to life. There are 52 items on my blog that I've tagged with his name, but most of the rest of my posts could legitimately have the same marking--since I first read the Journal of Biblical Counseling, David has been shaping the way I read my Bible, counsel others, and grow in Christ myself. So when one of my favoritist teachers writes a book on his topic of expertise, I get my hands on a copy immediately! 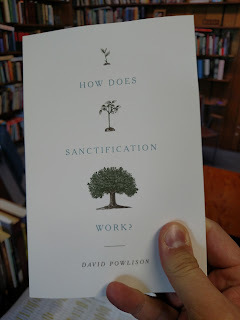 In How Does Sanctification Work?, David uses his characteristic wisdom to unravel the various biblical strands that form the rope of sanctification (promises, commands, influences, etc.). The table of contents shows the questions he answers along the way (ex. "Is There One Key to Sanctification?") and how he ends with several chapters of case studies to show, not just tell, what he has to teach. I've heard David lecture on these things before, and over the years, I've been greatly influenced by the teaching in chapter 3, "Truth Unbalanced and Rebalanced" where he gives this core premise, "Ministry 'unbalances' truth of the sake of relevance; theology 'rebalances' truth for the sake of comprehensiveness." Give the chapter a read to see what he means by that, but I can testify that it's really helpful for orienting your preaching, counseling, and discipling ministry. In other words, this is a great book by a great teacher, and if you want to understand the biblical doctrine of sanctification better, you should read it. Why Pursuing Sanctification Is More Than Just Remembering Justification from CCEF on Vimeo. Is Sanctification Complex or Simple? (David Powlison; CCEF) from Desiring God on Vimeo. I absolutely loved reading this novel. Death Comes to the Deconstructionist combines all kinds of things I love: detective fiction, first-person narratives of a complex inner life, page-turning stories written in a minor-key, the clash of big ideas, subtleties, literary allusions, unexpected juxtapositions, and the beautiful craftsmanship of good wordsmithing. Daniel Taylor's writing is kind of like Flannery O'Conner meets Dorothy Sayers meets Leif Enger with a touch of Lewis's Surprised by Joy. Or something. It's hard to describe--which is often a mark of a book I really love. This book is not for everyone (there are some very dark parts, though carefully executed), but I'm glad that I followed John Piper's recommendation in this article and borrowed a copy through our wonderful inter-library loan. I'm thinking about buying my own copy so that I can re-read it whenever I want. 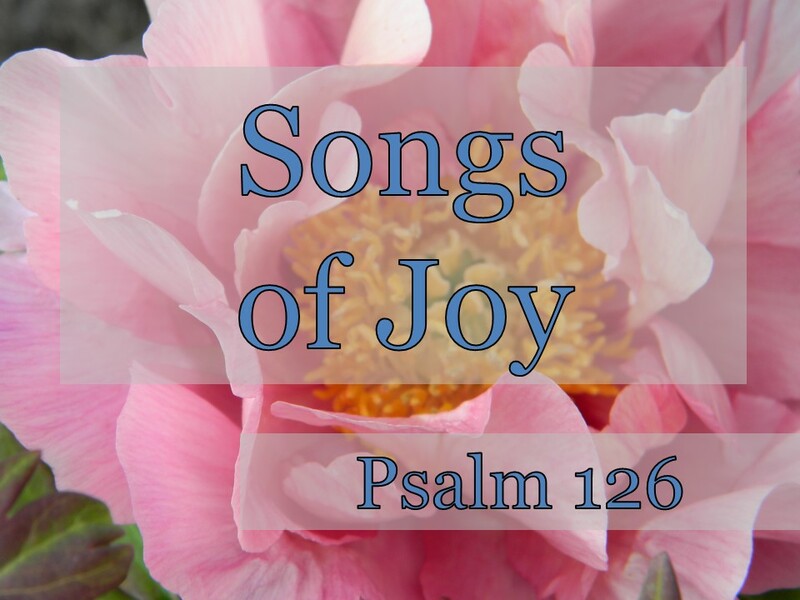 [Matt's Messages] "Songs of Joy"
Psalm 126 is one of my favorites. It’s one of the Psalms of Ascent, the songs that the Israelite pilgrims would sing as they made their way up to Jerusalem for the high holy days of Jewish worship in Old Testament times. It’s really beautiful, and it instills hope in anyone who reads it with a heart of faith. One of my Old Testament professors from Trinity Evangelical Divinity School says, “If we dwell thoughtfully in the atmosphere of Psalm 126 for long, we cannot remain disheartened. We will find in it a tonic for our tired arms, legs, and souls, for that is why God put this psalm in his Bible” (Ray Ortlund, When God Comes to Church, pg. 125). Doesn’t that sound good? Not as good as this psalm sounds! The language of Psalm 126 is just so stunningly beautiful and spiritually refreshing. One of the things I love the most about this psalm is that it looks both backwards and forwards. It looks back on what God has done and it looks forward to what God will do. And I think that followers of Jesus Christ need to have that kind of a perspective, both always looking backward and always looking forward. Because God has always been faithful in the past and always will be in the future, forever. And that’s one of the reasons why I picked this psalm for this Mother’s Day. Because Christian mothers need to have that same perspective, too. And that’s the message of Psalm 126. The idea is unbridled exclamations of gladness. Kind of like some of you when your team does something tremendous on the field or on the court or on the track. It’s an awesome feeling that must be made verbal. Songs of joy. I know that doesn’t even capture it. I remember the feelings Heather and I had when she gave birth to each of our children here today. Those were “songs of joy” days. And I see the joyful looks on the faces of these two couples today. Briana and Jeremy, Mary Beth and Jim. Big ear-to-ear grins. Life can be like that as God blesses. But life is not always like that. Is it? Life is not always a bed of pink roses. Life is not always continuous songs of joy on constant repeat. Not if we are being honest. And the Bible is always honest with us. Sometimes life is really hard. And painful. And difficult and uncomfortable. And it’s sad. And it hurts. That’s true for everybody, and it’s definitely true for mothers. Mothers live with heartache. It’s just part of the job. And it’s true for all of us. Life can be really tough. And Psalm 126 gives us a pattern for our prayers during those hard times. It falls neatly into two parts, verses 1 through 3 which I think look backwards and verses 4 through 6 which look forward. #1. THANK GOD FOR SONGS OF JOY IN THE PAST. Look again at verse 1. Now, we don’t know what situation the psalmist is referring to in verse 1, but we do know that it was a really good thing. The old NIV translates it, “when the LORD brought back the captives to Zion.” So it could be describing a return from exile. Maybe even the return from the Babylonian exile. But the new NIV (2011), translates the words in verse 1 the same way both of them translate the words in verse 4, “when the LORD restored the fortunes of Zion.” And that’s how the ESV translates it as well. The point is that there was this massive reversal of the situation for good. It doesn’t mean fortune as in luck. It means the situation, the state of affairs, the position. I love that. It seemed to good to be true. We were deliriously happy (cf. Derek Kidner). We just woke up and our dreams had come true! That’s how good it was. We were so incredibly happy we had to make some noise about it. Have you ever been so happy, you just had to make noise? And they were so joyful the world had to take notice. V.2 again. Others, outsiders, the world, had to admit that God had been good to them. We are so glad because we are so blessed. You see how the psalmist looks backwards? We’re going to see in just the next verse that this is not how things are right now. Things are not happy for the nation of Israel when the psalmist writes this. He remembers how good God has been to them, and he gives thanks. I love how we don’t know exactly what this psalm was about in history because it makes it easy to translate it right into our lives today. What great things has God done for you that you can remember and thank Him for? For some of you, it was the awesome mother that God gave to you. And the upbringing and nurture that she provided. For some of you, it was the children that God gave to you. And the minutes and hours and days and years that you have shared with them. For the Christians in this room, the greatest thing is our salvation. Don’t just think about physical blessings and material turnarounds. Think about the reversal of fortune, the change in your circumstances that God effected when He rescued you from the dominion of darkness and brought you into the kingdom of the Son he loves (Col 1:12)! Think about how you felt when you got saved. And the songs of joy. Victory in Jesus my Savior forever! And so many other ways that God has blessed you and me. And thank God for them! I will rejoice for He has made glad! Except so often we aren’t. So often we look around and we see the things that are bad and feel the things that hurt. And we long for things to change. Maybe you have lost your Mom. Or maybe you never had a good relationship with her. Maybe you wanted to have kids, but the Lord never gave them to you. Maybe your children are wayward or estranged from you. Or whatever difficult situation you face right now. Whatever difficult situation you face right now! Have you thrown a little child into the air and caught them? It’s so much fun. Jeremy and Jim, you are in for a treat. Because they just get this big eyed look on their face and giggle. And then your arms get tired, and you put them down, and what happens? That’s what the psalmist is saying to the LORD in verse 4. The Negev is a arid wilderness in the Southern part of Israel. It’s a very dry and desert like. But maybe once a year, maybe at Springtime, it will get a hard rain and spring to life. Turn this “parched life” (cf. Leslie Allen) into a garden. Bring your life-giving grace into our situation. You can do it. Suddenly rush in with your rain and restore us to blessing. #2. TRUST GOD FOR SONGS OF JOY IN THE FUTURE. And that begins with asking. And that could be something physical or more importantly something spiritual. “Bring me personal revival, Lord. It’s because the psalmist is thankful for the songs of joy in the past that he can ask and expect songs of joy in the future. And he does expect it. Look at how confident he is. V.5. He doesn’t just ask, he expects God to act. He doesn’t just assume that all of God’s blessings are back there in the past. He knows with a heart of faith that the best is yet to come. He’s certain, he’s trusting, because that’s how his God is and that’s how his God works. The metaphor in verses 5 and 6 is an agrarian metaphor, a figure of speech from the world of agriculture and farming. First you sow, then later you reap. What’s interesting here is that the psalmist is sure that the reaping will come. In the world of agriculture, that’s not always guaranteed. 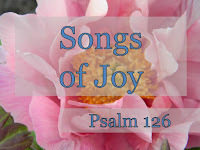 But the psalmist trusts God and expects God to provide for the Israelites songs of joy. Just as sure as God brings the seasons, springtime and harvest. There will be a reaping of songs of joy. Did you see that in verses 5 and 6? This is not some slappy-dappy Polyanna happy, happy, happy here. The point of verses 5 and 6 is that because you expect God to work, to answer your prayers, you keep on going. You keep on sowing. My Hebrew professor puts it this way, “The idea built into the Hebrew [of verse 6] is difficult to translate neatly into English, but the idea is something like this: ‘The one who faithfully, persistently, diligently, goes forth into the field weeping, carrying his bag of seed, shall with infallible necessity come again with a shout of joy, bringing his sheaves with him. The continual going out with tears is matched by the certainty of an abundant harvest coming back in” (Ray Ortlund, When God Comes to Church, pg. 141). Don’t stop. Keep going. Even through the tears. My wife has told me that a good number of our family dinners have been seasoned by her tears. They drop off of her face into the soup. She doesn’t feel like making dinner. She’s sad about whatever. But she keeps on going. She keeps putting one foot in front of the other. And she expects a big harvest. Little tiny seeds turn into great big sheaves. Big honking bundles of blessings. Trust God for those future songs of joy and keep on sowing until they come. My friend Blair Murray always saw evangelism in verses 5 and 6. Because we sow the word, right? 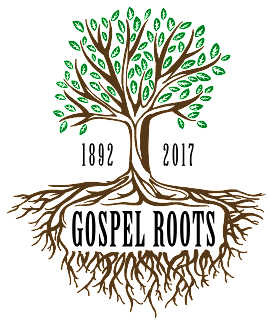 In Jesus’ parable, the seed is the Word of God, and we’re supposed to sow it, sow it, sow it. And therefore we expect to come home with converts, with new disciples. I think that’s a legitimate application of these verses. That’s one thing that we can be faithfully sowing into the fields of the world. But it’s just one of the ways that we sow spiritually. This is talking about everyday faithfulness. Motherhood is hard and often sad. Sow anyway. Sow in tears! Do the next thing. Cook, clean, feed, train, wipe, teach, forgive, dress, undress, spank, coach, coax, lift, push, pull, and carry. And then REPEAT! Keep sowing. Sow in tears if you have to. Prayers, parent-teacher conferences, little league games, soccer tournaments, doctors appointments, bills, bills, bills. Do the next thing. Keep going. Carry your seed out there and sow it. And expect God to work. Expect there to be songs of joy to come. But this is not just for mothers. It’s for all of us. It might feel a little bit like death. When our Lord Jesus did it, He sowed himself. He Himself was the seed going into the ground, but He came back up with a new glorious body, and we are His sheaves! Trust God for the songs of joy in your future. Keep going, even through the tears. I’m not saying that every prayer of our hearts will be answered in the way we want it. Not every wayward child, for example, will come home. God has not promised that. But He has promised good for His children. He has promised a bountiful harvest for those who trust Him and keep on sowing their seeds of faith and obedience. [Matt's Messages] "Where Stands It Written?" 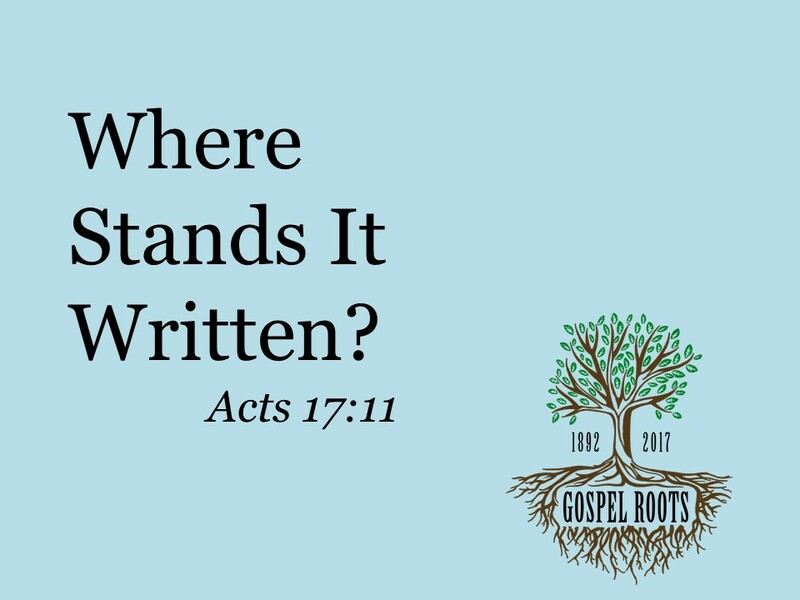 Today’s message is the next message in our Gospel Roots sermon series which looks back over the foundational values and practices and principles that undergird and nourish who we are today. 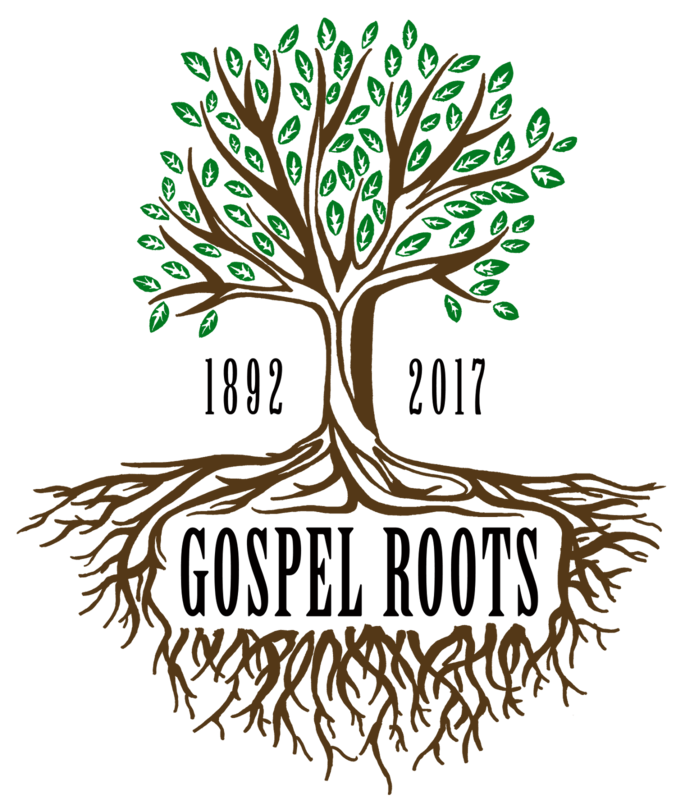 The root system that our church has grown up out of. This is the fifth message. It looks like we’re going to do one each month this year. In The first and most foundational was the gospel itself: Jesus Christ and Him Crucified. The gospel of Jesus Christ is the reason we are here. The fourth message was about being a praying church. Devoting ourselves to prayer, being watchful and thankful. And today’s message is about building our church on the Word of God, the Bible. Wait a second. Maybe you can’t read that. Has anybody ever heard that phrase? That was one of the watchwords of the founding of the Free Church movement in Europe and in the United States. Do you know very much about the history of the Free Church even before Lanse Free Church? Our forebears in the faith came from Scandinavia, the countries which had followed Martin Luther in the Reformation, especially for us here, Sweden. This year marks the 500th anniversary of the Protestant Reformation when Martin Luther nailed up his 95 Theses to the church door at Wittenburg. He was called to account for his teachings which were a rediscovery of the gospel of grace. We’ll talk about that more in the coming months as we dive into the book of Galatians. When Luther was called before the leaders at Worms, he was asked to recant his teaching, but he had come to believe that he was teaching the gospel in accordance with the Scriptures. Unless I am convinced by the testimony of the Holy Scriptures or by evident reason–for I can believe neither pope nor councils alone, as it is clear that they have erred repeatedly and contradicted themselves–I consider myself convicted by the testimony of Holy Scripture, which is my basis; my conscience is captive to the Word of God. Thus I cannot and will not recant, because acting against one's conscience is neither safe nor sound. God help me. Amen. He took his stand on the Scriptures. Scripture alone is the supreme authority for Christians. And the Scandinavian countries adopted Lutheranism. However, they did not let everybody read the Bible for themselves. I know; it’s hard to imagine. But they didn’t want everybody to make their own choices about the Bible. They wanted to maintain state control of the churches and have the pastors teach an authorized version of the Bible and keep everybody together on the same page. But some of the believers started to read the Bible for themselves and gather to read the Bible for themselves together. A network of small Bible studies sprang up in Norway, Denmark, and Sweden. They were the Lay Bible Readers Movement. And they experienced revival and they grew. Where stands it written? Where did you get that? Show me that in the Bible. And then those Swedes immigrated to America. Our church was founded by immigrants. And they didn’t speak English. They spoke Swedish, at least at first. And some of those old Swedes settled in Lanse, Pennsylvania to work in the coal mines. And a few of them gathered together and formed a church. Here’s our artifact for today. It’s probably the oldest thing in the room. One of the oldest things in the building. It’s a Bible owned by the church in Swedish dated January, 1911. It’s 106 years old. It’s a really cool thing to hold it. And for the first 60 years of our church, the preaching was in the Swedish. Some people get mad that immigrants take their time to learn the central language of their new country. Well, I’m sure that many of our forefathers learned some English to communicate with their neighbors, but when they went to church for the first 60 years, the preaching was in Swedish, the language of their hearts. The Bible down there on the Communion Table was given to the church in 1952, that’s the year that the preaching switched consistently to English, 65 years ago. It was given in memory of Mrs. Jennie Swanson, and it is a King James Version in the Old English, 1611. How many here cut your teeth on the King James Version of the Bible? Amen! Many of you have copious amounts of Scripture memorized in the King James Version.“For God so loved the world, that he gave his only begotten Son, that whosoever believeth in him should not perish, but have everlasting life.” Right? And there are a lot more Bibles here in this room. The Pew Bibles were bought about 18 years ago. They are in the version that I cut my teeth on, the New International Version, copyright 1984. And there’s a lot of those in this room. That’s what I tend to preach from every week. But there are a lot of versions in this room. What other versions do we have. NASB? I think that was the favorite of Pastor Curry, my predecessor. We learned at district conference that a lot of the pastors in our district use that one every week. ESV. That’s my wife’s favorite. It’s really good. I like the ESV Study Bible. The updated NIV 2011 version. That’s another good one. We tend to give that one away to our high school graduates. I remember Marie Wertz used to carry the NEB. There’s a new one out called the CSB. The Christian Standard Bible. And they have a new Study Bible. I want to get it. It looks really good, too. And some of you have your Bible on your phones, right? It’s not just turn in your Bible. Turn on your Bible. And there are so many versions that you can access through your phone, now. The point is not to get everyone to use the same translation. The point is to get everyone looking at the Scriptures. Because that question doesn’t come first from Lanse, and it doesn’t come first from Sweden, and it doesn’t come first from Martin Luther. It’s a Bible question. It’s a question they were asking in Bible times, and rightly so. It was the question that the Bereans were asking in our passage for today. Acts chapter 17. The apostle Paul and his team had just been to Thessalonica where they had founded a church to whom Paul would later write the letters of 1 and 2 Thessalonians. But their preaching was stirring up trouble, so Paul had to leave town. Let’s start in verse 10. The Bereans were of more noble character than the Thessalonians. Not because they were better people or more holy, but they were excited and careful about receiving the word. These folks were Bible people through and through. #1. RECEIVE THE MESSAGE WITH GREAT EAGERNESS. Receive the message (literally, the Word) with great eagerness. That’s what the Bereans did. They were so happy to hear God’s word. They were hungry for it. Are you hungry for the Word? Is that how we take in God’s Word? I had the hardest time writing this message because I care so deeply about this. This is my life. This is what I’ve staked my life on and is my life’s work–studying and preaching and teaching and counseling out of God’s Word. For 19 years now, I’ve been studying this book during the week to share it with you on Sundays. And I believe every single word of it. I don’t understand every single word of it. But I believe it. Every jot and tittle. I believe that “All Scripture is God-breathed and is useful for teaching, rebuking, correcting and training in righteousness, so that [we] may be thoroughly equipped for every good work” (2 Timothy 3:16-17). I’ve preached all the way through Genesis, Exodus, Numbers, Joshua, Judges, Ruth, 1 Samuel, 2 Samuel, The Books of Kings, Hosea, Mark, Luke, John, Acts, Romans, Ephesians, Philippians (twice! That was the first one I preached through in 1998 and then did it again in 2004), Colossians, 1 Timothy, Titus, James, 1 Peter, 1 John. And I’ve preached messages from many of the rest of them. I hope to preach every single verse of the Bible in my pastoral ministry here at some point, if the Lord gives me the opportunity. Because this is a church that is eager for the Word. That is our history and our heritage and I hope it’s our heart today. How many of you started coming here in large part because of the preaching ministry and the dedication to God’s Word? Whether it was Jack Kelly or me or whomever? I remember after I preached my candidating message in April of 1998, we had a church family meal back that hallway. Anybody remember what my sermon was on that candidating weekend? Extra points if you do. It was the book of Habbakuk in the Old Testament. I picked that one because it was probably my best one at the time, but I also wanted to know if you guys really wanted the Bible or just jokes and inspirational stories. I figured I’d give you a Minor Prophet and see what happens. He was receiving the message with great eagerness. And I just wanted to come and give this church the Word of God. This is a church that is dedicated to the Bible. We have Family Bible Week. We have Family Bible Night. We have Link Group Bible studies. We have Bible at our Prayer Meeting. We have Sunday School Classes that study the Bible. Our current classes are going through the whole story of the Bible from Genesis to Revelation in 3 years. And then we’ll probably start over again! Our children’s church teaches the little ones the Bible. We give away “Our Daily Bread”–Bible. We have Bibles out there on the table. We buy them and sell them at cost so that everybody has one. We do the “Hide the Word” Bible memory verses as a church. The B-I-B-L-E is the book for us! And the point is not to have a Bible and have it just sit there or even to memorize it. The Muslims memorize their Qurans and they revere them, but they don’t have them translated into heart languages and they don’t try that hard to understand them. At least the normal everyday Muslims. They leave that to the professionals. The imans, the scholars. But not in Christianity. In Christianity, the point is not the physical book but the words and the truth that they convey. The Bible is for everybody. The Christians Scriptures are for everybody to receive with eagerness and to teach each other. Not just the professional leaders. Not just the pastors. One another. Are we receiving the Word with great eagerness? One of the highlights of my year is teaching the Adult Bible Class at Family Bible Week. Because what I like to teach is not just the Bible but how to study the Bible for yourself. And the students come so eager to learn. So we’ve learned that the Bible is a library, not just a book, with different kinds of books inside of it. We’ve learned about Proverbs, and Psalms, and Narratives, and Gospels, and Epistles, and Law, and this last year even Apocalyptic Literature! There is so much to learn in these pages. This is where the power is. That’s right. And there is so much blessing here! “Like newborn babies, crave pure spiritual milk, so that by it you may grow up in your salvation, now that you have tasted that the Lord is good” (1 Peter 2:2-3). Receive the message with great eagerness. Verse 12 tells us that many of them became believers at that point. Praise the Lord! They received the message of the gospel and it changed their lives forever. Do you need to receive the message for the very first time? Have you received that message with great eagerness? Because those that receive Him, those that believe in His name, He gives the right to become children of God (John 1:12)! I invite you to receive Him right now. Are we hungry for the Word of God? Are we reading our Bibles? Remember the sermon on King Josiah back in February, when they found the Book of Law that had been lost? We said, Read Your Bible, Heed Your Bible, Bleed Your Bible. When was the last time you did something because your Bible told you to? I wonder how many sermons have been preached from the Bible here at Lanse Free Church? I’m sure it’s over 7,000 when you add up Sunday mornings and Sunday nights and special occasions. Are we in our Bibles and are our Bibles in us? Here’s number two and last. #2. EXAMINE THE SCRIPTURES EVERY DAY. Look at verse 11 again. If they had to do that with Paul, how much more should you be checking up on me? That’s why I preach the way I do. Did you ever notice how I’m always trying to get you to open your Bibles and I’m always trying to tell you what to look at in them? What are some of my favorite sounds at church? The sounds of babies crying. And the sounds of the whole church singing, especially voices only. And the sound of pages turning in your Bibles. I don’t want you to believe things just because Pastor Matt says to. I want you to examine the Scriptures every day to see if what Pastor Matt said was true. I almost didn’t preach this message today because Daniel Stanley did it last week. The first initials of that is where they got the word AWANA"Approved Workmen Are Not Ashamed.” And our church had an AWANA program, too. And that means that sometimes we’re going to disagree. We’re going to come to different conclusions. Because we’re fallen and limited and come from different starting places. And that’s frustrating when that happens. But the Free Church has had a good approach to that problem, too. One of key leaders in the middle of the 20th century was called Arnold Theodore Olson. The chapel at Trinity is named after him. I never got to meet him, but I saw him there before he died. Dr. Olson coined a phrase called, “The Significance of Silence,” and the point of that is that there will be times when we disagree with each other on secondary matters. As long as we agree on the essentials of the gospel, then we speak together with one voice. But on a number of secondary matters, we have silence. Not that we don’t talk about those things together and even argue about them and debate them and sharpen one another. But we are silent on the matter as a whole association of churches. We don’t speak with one voice about those secondary things. And Dr. Olson in his book talked about differences among Free Church people in the areas like baptism, the Lord’s Supper, Calvinism vs. Arminianism, and the finer points of eschatology. We have our views and we keep talking about them and we keep comparing them from Scripture to Scripture asking, “Where Stands It Written,” but we don’t fight over them or divide over them. We stick together standing on the gospel. I love THAT about our family of churches, as well. We have a sense of biblical priorities and proportions. We don’t just keep examining the Scriptures and receiving them with great eagerness, we also glean from them what is most important and what is secondary or even tertiary or even fairly insignificant. If I preach something up here that you disagree with, I’m good with that if you are getting your disagreement from the Bible itself. I don’t want a cult of little Matt Mitchell clones running around town, parroting what I say whether they know where it comes from or not. I want a church family of men and women and boys and girls that know their Bibles. They examine them every single day! And they think for themselves about what they see there. What is the most recent thing that you have discovered from your own reading of the Bible? What is the thing that you have learned most recently from the Word of God that has made a difference in your heart and life? You won’t be changed if you don’t read it or memorize it or listen to it. Examine the Scriptures every day. And you’ll be a Berean. And you'll be a Lanse Free Church person. And you’ll see more and more of Jesus and Him Crucified. Jesus is the whole point of the Bible. He is where the Old Testament is going and what the New Testament is proclaiming. And He is what we celebrate at this Table together. Jesus Christ and Him Crucified.